Ibo et Non Redibo: Christ, be our King! As with many mysteries of our faith, the Church sees more than just one meaning in the Kingship of Christ. St. Ignatius of Loyola captures a sense of this Kingship exceptionally well in the “Meditation on Two Standards” in the Spiritual Exercises (SE): “…Christ calls and wants all beneath His Standard, and Lucifer, on the other hand, wants all under his” (SE 137). Each of us is faced with a crucial decision: to whose Kingdom will I belong? There is Christ’s Kingdom where he is King, and there is the kingdom of the “enemy of our human nature” (SE 325). This Solemnity therefore encourages us to consider our life’s direction: do we desire to crown Christ as the king of our lives, our families, and our society? Do our lives reflect our commitment? Another very important meaning that the Church gives to this Solemnity builds on the first. Christ is our personal King, the King of our hearts; but he is also much more than that. As it says in the book of Revelation, Christ is the “Lord of lords, and King of kings” (Rev 17:14). He desires to have all leaders and nations under his rule of truth and goodness. Christ is a King who desires to be heavily involved in our society, in our politics, and in our economy. Indeed, Pope Pius XI makes this very clear in Quas Primas: “the manifold evils in the world are due to the fact that the majority of men have thrust Jesus Christ and his holy law out of their lives; that these have no place either in private affairs or in politics: and we say further, that as long as individuals and states refuse to submit to the rule of our Saviour, there would be no really hopeful prospect of a lasting peace among nations” (QP 1). He then expresses a great hope for bringing Christ back to society: “the rebellion of individuals and states against the authority of Christ has produced deplorable consequences. … We firmly hope that the feast of the Kingship of Christ, which in the future will be yearly observed, may hasten the return of society to our loving Saviour” (QP 24). We must not keep Jesus a secret! He is to be proclaimed to the ends of the earth; he is to be a part of our private and public life. The future of a healthy society depends on this public proclamation of Christ’s reign; otherwise, Christian values will not be preserved. Cardinal Louis Pie of Poitiers keenly observed that “so much as Christ does not reign over societies, that much does His influence over individuals themselves remain superficial and precarious. … If you attempt to convert individuals without wishing to Christianize their social institutions, your work remains frail.” We pray the Our Father every day in which we boldly say “…Thy Kingdom Come…”; if Christ’s Kingdom does not affect the reality of our existence, what kind of Kingdom are we exactly praying for? I conclude with Pope John Paul’s II first remarks as Pope at St. Peter's Square in 1978: “Do not be afraid! Open wide the doors to Christ! Open to his saving power the confines of states, economic and political systems, as well as the vast fields of culture, civilization and development. Do not be afraid!” May we not be afraid to bring Christ to our Canadian society and its institutions! Today, we celebrate along with the whole Church the Solemnity of Jesus Christ the King. The "whole Church" does not celebrate Christ the King today. 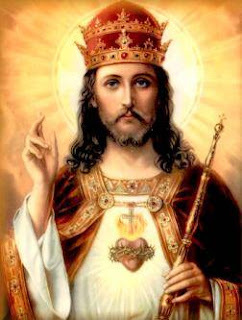 Roman Catholics who follow the 1962 Missal celebrated Christ the King on the last Sunday of October, the original date of the feast (it was moved to the end of the liturgical year in 1969). Moreover, this is a uniquely Latin feast - it is not celebrated by any of the Eastern Catholic churches. Many good things can be said of this feast, but one cannot say that it is celebrated today by the "whole" Church.